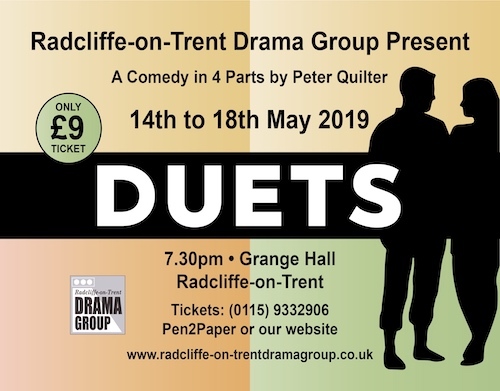 Duets - Nothing to do with opera this time. A comedy by Peter Quilter starts rehearsal on Thursday and then every Monday and Thursday till 6th May. Quartet - Photos taken during rehearsals are now uploaded to the website. Go to Past Productions and click on the image next to Quartet. Praise for Quartet - "What a brilliant night. Laughs from start to finish. You were all fantastic. Well done to you all"
Please do keep in touch - For both Facebook and Twitter you will need to have an account. On Twitter - simply log in, click 'Follow' and you will then be notified of all future events! On Facebook - simply log in, Click Like below the Page's cover photo and you will then be notified of all future events! Radcliffe-on-Trent Drama Group take your privacy seriously. We have always operated a strict opt-in policy for marketing communications. You only receive e-mails from us because you have previously given your consent and we will only use your personal information to inform you of our forthcoming productions. You can request removal of your details from our mailing list at any time by e-mailing our ticket secretary. If you have any comments about the website or content on the site please contact me and I will get back to you as soon as possible.